Start your new truck empire in Europe! of Euro Truck Simulator 2 and . 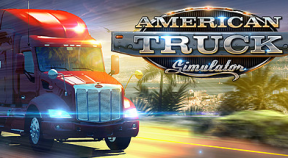 Take advantage of additional features of American Truck Simulator by joining our online community on , our center for virtual truckers all around the world interested in Euro Truck Simulator 2, American Truck Simulator and future SCS Software's truck simulators. To join , simply sign up with your Steam account . You will need to own or to join World of Trucks.